feeling stitchy: The New CrossStitcher: preview + free patterns! You can usually find that publication in Barnes and Noble and Borders here in the US. It is one of the easier ones to find, love it. I buy it at Joann's. I live in North Dakota, so I imagine it's available in more populated places as well. I live in Alberta, Canada and I can find CrossStitcher in Chapters or Indigo stores for about $11. It tends to be about two issues behind, but it's well worth it. Yep like the others said you can usually find it in the nicer book stores. 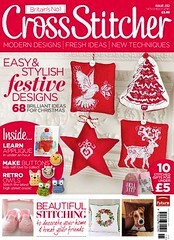 I know I can find a few other British Cross Stitch magazines as well! I would offer to get you this one but I think it's already gone and the they have the next one already.